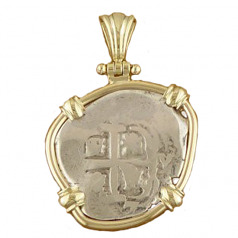 Spanish 2 reales silver cob pendant. 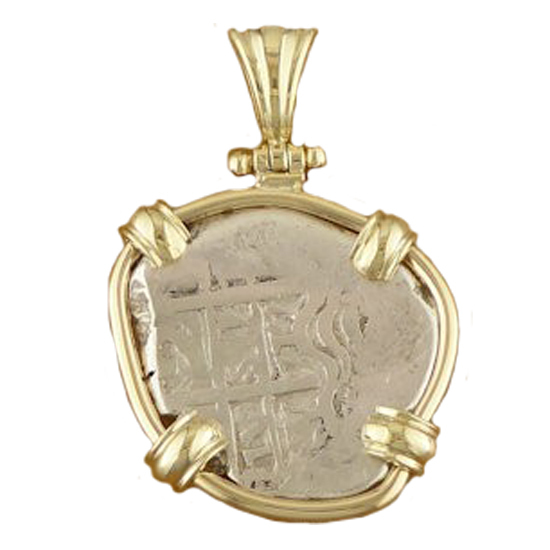 Obverse: Pillars and waves design within which are mint, denomination, assayer, PLV SVL TRA (stands for plus ultra or “more beyond”), and date “717”.Reverse: Cross of Jerusalem or “Potent Cross” with rampant lions of the Leon family and castles of the Castile family in the quadrants, surrounded by legend. Ruler: Phillip V. Mint: Potosi, Bolivia. Date: 1717. Assayer: Y. Framing: 14Kt . Certificate of Authenticity.